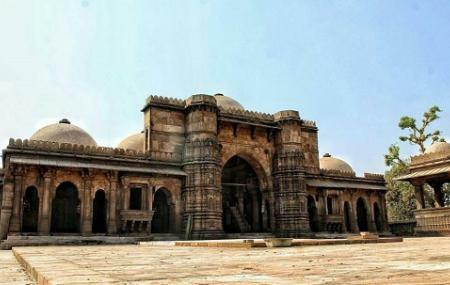 It is one of the most revered shrines in Ahmedabad and was brought to existence by Bai Harir Sultani who was the superintendent of the harem of Sultan Beghara. The place has a very Jubilant architecture complete with a beautiful Mihrab, prayer hall and a lush courtyard. There are beautiful Arabic inscriptions scripted throughout the building of the mosque. Not only that, there are various sculptural works too which are accommodated in the prayer area of the mosque. On walking around the area, you will also find some semblance to the Gujarati architecture in the place. Located near Dada Hari Vav and Bai Harir’s tomb, the mausoleum, with its intricate designs and thoughtfully built architecture surely leaves a great impact on anyone who is visiting the place. Wear modest clothes and cover your head. How popular is Hazrat Harir Ra Masjid? People normally also visit Shree Mahalaxmi Temple while planning their trip to Hazrat Harir Ra Masjid. A very nice and calming place, the Imam / manager of the mosque and his son are very nice and open. They can explain the history of this monument without asking for money. Donations can be made voluntarily. Nice place with mosque made from red stone and with craft work. Gumbbaj of mosque is so big and pleasent. Small work made on wall of mosque is unique. Love the place ! Very well maintained and beautiful carvings on the each and every columns and walls.